Robust rodents 11 to 13 inches long, weighing 1½ to 3 pounds, with broad, rounded heads, hairy tails and short legs. They are brown in color, with darker ears and a pale buff to whitish belly. They have 22 teeth. Short and medium grass prairies and plateaus. Grasses, roots, weeds, forbs, blossoms, and occasionally insects. All their water comes from their food. 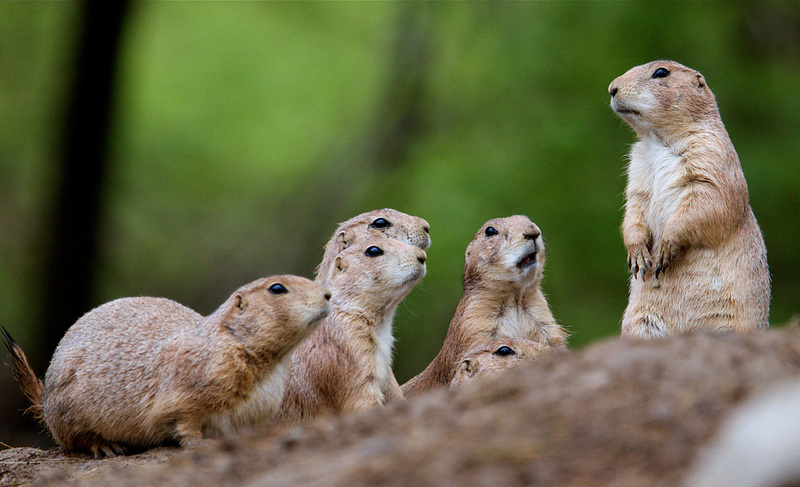 Prairie dogs have an intricate social system composed of one male and several close-kin females and their offspring. Populations vary from 5 to 35 per acre. Mating generally occurs in late January, with the young being born in March and April. Females give birth to one litter a year, usually 3 to 5 pups, but sometimes as many as 8. The young are blind and hairless. Their eyes don’t open for 33 to 37 days. At 6 weeks they begin to appear above ground and are ready to be weaned. Prairie dogs eat only seven percent of a ranch’s forage, however, eradication programs have been underway for decades in the American West. Experts have now determined that prairie dogs may actually be beneficial; they are natural fertilizers who also increase the protein content and digestibility of rangeland grasses. But, after decades of eradication by federal, state, and local governments, devastation from disease, poisoning, recreational shooting and habitat destruction, prairie dogs are rapidly disappearing. More have been exterminated than remain. They inhabit only about two percent of their former range. 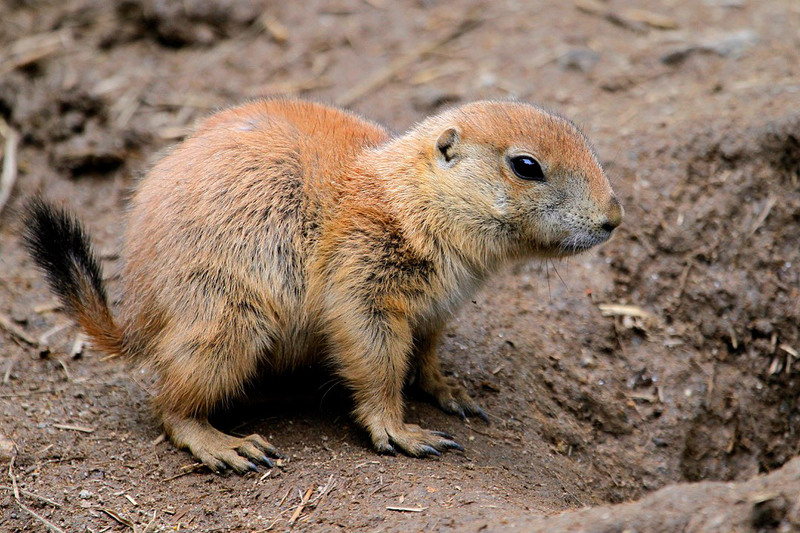 When prairie dogs sense danger, the sentinel prairie dog gives a two-syllable sharp, warning bark, bobs up and down, calls again, and then quickly disappears in its burrow. Other prairie dogs farther from the danger zone watch, and if the predator gets close will repeat the warning call. Prairie dogs dig burrows with tunnels leading to chambers for denning, storage and nesting. The entrance holes are funnel-shaped and lead down steep tunnels 15 or 16 feet before leveling off for another 20 to 50 feet, ending in a chamber. 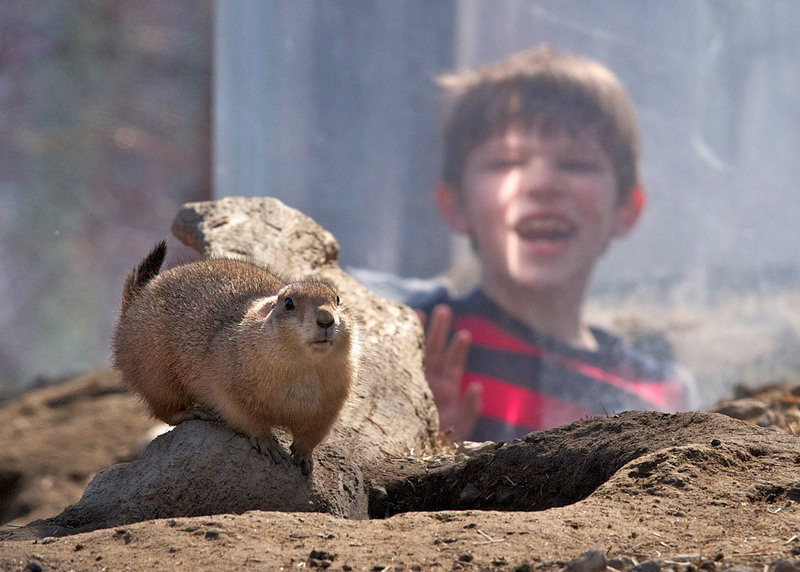 You can visit the Zoo’s prairie dogs along the Hoofed Stock Trail and even tunnel your way into the heart of their town and pop up to see who’s on guard duty.